As more than 500 guests streamed into the Leo and Joan Mahoney Wellness Center on Saturday evening for the We Are St. John’s Gala, few could have imagined the heartwarming and inspiring program that awaited them. 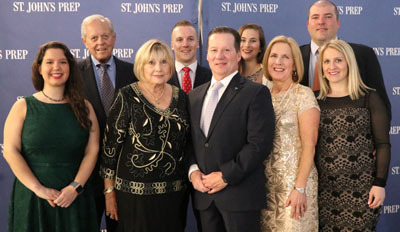 On a night filled with powerful anecdote and reminiscence, the Prep community inducted eight individuals into the school’s Hall of Honor and bestowed the same distinction on the Boston-based Catholic Schools Foundation. The annual gathering to support St. John’s students and salute extraordinary community members featured its traditional atmosphere of festive sophistication, energy, and aesthetic appeal, but the celebration itself was a penetrating and poignant affirmation of family, faith and education. Pictures from the Gala. As alumni, parents, faculty, staff, friends and benefactors made their way into dinner, they were treated to the musical stylings of the St. John’s Prep Celtic Band, as well as the artistry of violinist JT Betz ’23, who was accompanied by music teacher Diane Hastings. Following Dr. Hardiman’s welcoming remarks and a blessing by Principal Keith Crowley, four Hall of Honor presentations—a recognition of community members Hardiman said have “helped weave the tapestry of life at St. John’s for decades”—captivated the crowd. The first to receive the crystal eagle statue that marks the occasion were Judie and Joe Levis ’60 P ’85 ’92 ’94. As volunteers, leaders, and benefactors, they have quietly helped shape the Prep campus and create opportunities for students today and into the future. Since graduating from St. John’s in 1960 and founding Crusader Paper Company in 1967, Levis served from 1986 to 1996 as a St. John’s trustee. In 2000, St. John’s honored his commitment by presenting him with the school’s eight Distinguished Alumnus Award. Together, the couple has supported not only St. John’s, but other charitable efforts that reflect their sense of faith and service, including Catholic education, breast cancer awareness, and the fight against homelessness. Next to be inducted were the Hines family. A model of public service forged through faith and personal experience, the family founded the 1st Lt. Derek Hines Soldiers Assistance Fund to assist Massachusetts soldiers who have incurred career-ending or life-threatening injuries while on active duty. Susan and Steve Hines, together with their children—Ashley, Michael ’02, and Trevor—created the non-profit to honor their son and brother, Army 1st Lt. Derek S. Hines ’99. For her part, Derek’s mother, Sue, deflects credit for the family’s good works and characterizes the family’s contributions as a calling. “It guess I’ve always felt like this is what we should do,” said Hines. “For us, this has always been about community and living life the best way you can without someone you love so much. Derek’s yearbook quote was: ‘I want to strive to be like my parents.’ I think he’d be so proud of tonight and I know he’s here with us. For me, I just want to be Sue and teach and lead my kids to be good people. That’s your role. The final individual honoree of the night was math teacher Liz Dobrowolski (pronounced Dough-bro-volski). Ms. Dobrowolski’s reputation for inspiring students beyond the classroom is well known across campus. Since coming to St. John’s in 2008, she has immersed herself in what the Xaverian Brothers like to call the “common, ordinary, unspectacular flow of everyday life.” But her impact has been anything but ordinary. "One of the hallmarks of Xaverian education is the formation of interpersonal relationships—getting to know students and what they're all about," said Dr. Hardiman. "Math is one of those subjects that can create anxiety, but Liz makes her classroom a place of trust and community, a place where students develop confidence. She also empowers students with her involvement in co-curricular life. To put it simply, Liz lets every student know that she believes in them." A native of Dover Plains, New York, Ms. Dobrowolski holds a bachelor's in mathematics and secondary education from the University of Scranton, and a master's in mathematics from Boston College. In addition to being actively involved in co-curricular life, she introduced St. John’s to Camp Sunshine in Casco, Maine. Several times a year, she brings students to this retreat for young people living with life-threatening illnesses and their families, and Camp Sunshine has become part of the extended Prep community. Since its founding in 1983, the Catholic Schools Foundation (CSF) has made it possible for thousands of students to attend Catholic elementary and secondary schools in the Archdiocese of Boston. The foundation’s signature program, the Inner-City Scholarship Fund, provides students with access to the formative experience of a Catholic education, inspiring them to grow in body, mind, and spirit. Partnering with 84 schools, including St. John’s, the foundation provides $8 million for some 4,000 students. By inducting the foundation into its school’s Hall of Honor, the Prep celebrated its long-standing relationship with the organization and all that the two institutions have achieved together. Before the program closed with a Flash Fund It event that raised almost $50,000 for tuition assistance, the audience was treated to a video feature on alumnus Don Bessom ’03, who has developed the Strong Wings project to assist military veterans. The centerpiece of the Lynn native’s work is an mobile app called Strong Wings, which is designed to streamline intake for substance abuse centers and make it easier for people in crisis situations to find a place to go for treatment using a real-time map. Bessom credits his time at St. John’s as the launchpad for his commitment to giving back, and his story is a heartfelt example of an adult drawing upon those lessons learned at St. John’s to embrace servant leadership in his later life. “The coaches and the mentors I had at this school changed my life forever,” said Bessom. “The teachers here taught me the value of integrity and they taught me how to understand and comprehend loss. They tapped into that center a kid might not think is there and let it flow. The tools and skills they gave me transcended the classroom, and the passion for servant-leadership they taught me has never left me.